The late nineteenth and early twentieth centuries saw an explosion of spiritual teachers and impresarios dealing in “secret wisdom.” Their ranks included hacks and frauds – as well as more than a few genuine scholars of esoteric traditions. Most have vanished from memory, their writings a historical footnote. There exists one distinct figure, though, whose movement and teachings not only survived his passing but are even experiencing a revival in our day. 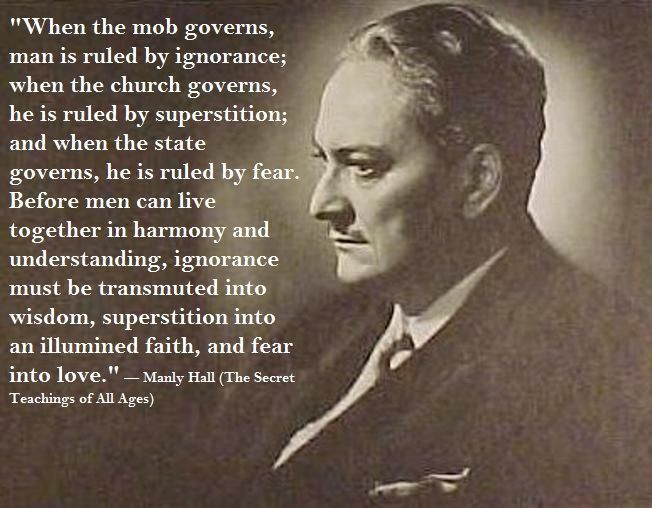 His name is Manly P. Hall. While few academicians will ever know of him, Hall was among the twentieth century’s – and perhaps any century’s – most commanding and unusual scholars of esoteric and mythological lore. Yet the source of his knowledge and the extent of his virtuosity can justly be called a mystery. While working as a clerk at a Wall Street banking firm – the “outstanding event” of which involved “witnessing a man depressed over investment losses take his life” – the 28-year-old Hall self-published one of the most complex and thoroughgoing works ever to catalogue the esoteric wisdom of antiquity, The Secret Teachings of All Ages. Hall’s Secret Teachings is almost impossible to classify. Written and compiled on an Alexandrian scale, its hundreds of entries shine a rare light on some of the most fascinating and little-understood aspects of myth, religion, and philosophy. Today, more than seventy-five years after its initial publication, the book’s range of material astonishes: Pythagorean mathematics; alchemical formulae; Hermetic doctrine; the workings of Kabala; the geometry of Ancient Egypt; the Native American myths; the uses of cryptograms; an analysis of the Tarot; the symbols of Rosicrucianism; the esotericism of the Shakespearean dramas – these are just a few of Hall’s topics. Yet his background betrays little clue to his virtuosity. Hall was born in Peterborough, Ontario, in 1901 to parents who would shortly divorce, leaving the young Manly in the care of a grandmother who raised him in Sioux Falls, South Dakota. He had little formal schooling. But there was a spark of some indefinable brilliance in the young man, which his grandmother tried to nurture in trips to museums in Chicago and New York. Tragedy struck early, when his grandmother died when he was 16. Afterward, a self-styled Rosicrucian community in California took him in. At age 19, suspicious of the community’s claims to ancient wisdom, Manly moved on his own to Los Angeles where he began a precocious career in public speaking – first giving an address on reincarnation in a small room above a bank in Santa Monica, and soon rising to the rank of minister at a liberal evangelical congregation called The Church of the People. Word spread of the boy wonder’s mastery of arcane and metaphysical subject matter. He attracted benefactors and eventually began travelling the world in search of hidden wisdom. Yet Hall’s early letters from Japan, Egypt, China, and India are, in many respects, fairly ordinary: They contain little of the eye-opening detail or wonder of discovery that one finds in the writings of other early twentieth-century seekers encountering the East for the first time. More often they read like prosaic, if somewhat sensitive, linear travelogues of their day. The short book goes on to expound passionately and in detail on Egyptian rites, Arthurian myths, and the secrets of alchemy, among other subjects. Feeling the power and ease in its pages, the reader can almost sense the seeds of greatness that were beginning to take hold in Hall’s grasp of esoteric subjects. Hall soon returned to America, where he tried his hand at banking – though he found his true path in the beaux arts Reading Room of the New York Public Library. Entering this cavernous space today, it is not difficult to picture the large-framed, young Manly P. Hall surrounded by books of myth and symbol at one of the room’s huge oaken tables. Like a monk of the Middle Ages, Hall copiously, almost superhumanly, pored over hundreds of the great works of antiquity, distilling their esoteric lore into his volume. By the age of 28, having pre-sold subscriptions for nearly 1,000 copies (and printing 1,200 more), Hall published what would become known as “The Great Book” – and it has never gone out of print since. Indeed, Hall is an exception to most of his contemporaries as someone whose work is actually building in influence today. In its day, the Secret Teachings was expensive, hefty, and cumbersome. As a result, the book spent much of its existence as an underground classic. In late 2003, however, the Secret Teachings found new life in a reset and redesigned “reader’s edition,” which has sold a remarkable 40,000 copies in less than three years. 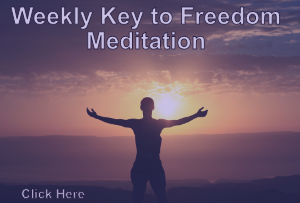 (For further details, see “Bringing the Secret Teachings Into the 21st Century” by Mitch Horowitz at www.lapismagazine.org). A little-known 1929 companion volume by Hall, called Lectures on Ancient Philosophy, has also been recently reissued. After publishing his magnum opus, Hall opened a campus in 1934 in the Griffith Park neighbourhood of Los Angeles called The Philosophical Research Society (PRS), where he spent the rest of his life teaching, writing, and amassing a remarkable library of esoterica. A self-contained property designed in a pastiche of Mayan, Egyptian, and art deco styles, PRS remains a popular destination for LA’s spiritually curious. Following Hall’s death in 1990, PRS barely survived simultaneous legal battles – one with Hall’s widow, who claimed the group owed her money, and another with a bizarre father-son team of con artists who, in the estimation of a civil court judge, had befriended an ailing, octogenarian Hall to pilfer his assets. The Los Angeles Police Department considered Hall’s death sufficiently suspicious to keep it under investigation for several years. For all his literary output, Hall revealed little about his private life. His most lasting record is a frequently trite, unrevealing childhood memoir called Growing Up with Grandmother (in which he refers to his guardian as “Mrs. Arthur Whitney Palmer”). As an adult, Hall’s close relations were few. He did not marry until well into middle age, in a union some surmise was never consummated. Here was someone with a tremendous interest in the arcane philosophies of the world, in the occult and metaphysical philosophies, but he wasn’t fixated on immortality, or a will to power, or on discovering keys that unlock the universe. Rather, he was focused on harnessing inner truths in a very practical way. How, he wondered, could such ideas lend clarity to daily life? We’ll take a byroad that steers us in another direction before returning to this point. Our byroad involves one of the most famous novels in history, Mary Shelley’s Frankenstein. The work has many facets, among them a portrait – not sympathetic, but not as unsympathetic as one might suppose – of the European occult in the Enlightenment era. The portrait comes in the character of a young Victor von Frankenstein, a budding scientist torn between the occult teachings that drew him to science as a child and the prevailing rationalism of his teachers. Victor confides his interest in the great alchemists and occult philosophers, such as the Renaissance-era magus Cornelius Agrippa, but his professors dismiss him with complete condescension. I had a contempt for the uses of modern natural philosophy. It was very different when the masters of science sought immortality and power; such views, although futile, were grand; but now the scene was changed. The ambition of the inquirer seemed to limit itself to the annihilation of those visions on which my interest in science was chiefly founded. I was required to exchange chimeras of boundless grandeur for realities of little worth. For Hall, the very act of writing The Secret Teachings of All Ages was an attempt at formulating an ethical response to the age he lived in. While the book is at times speculative and some of its sources are limited by the constraints of their era, it is the only codex to esoteric ideas that treats its subject with total seriousness. Contemporaneous works, such as The Golden Bough, regarded indigenous religious traditions as superstition – interesting museum pieces worthy of anthropological study but of no direct relevance to our current lives. Hall, on the other hand, felt himself on a mission to re-establish a connection to the mystery traditions at a time when America, as he saw it, had given itself over to the Jazz-Age materialism he witnessed at his banking job. In this sense, the prodigious scholar achieved more than a cataloguing of esoteric truths. He turned the study of occult ideas into an ethical cause. Thank you very much, for bringing Manly P. Hall in the spotlight. His lectures, with that unique sense of humour of him, are to this day inspiring and informative. I love the practical approach with examples that have a connection with daily life and knowledge of human-ness. Clearly coming from a pre-computer era.